Can I just say how much of a pain it is getting decals sorted? I used to make my own - there's a page at littlefishbicycles describing my rather arduous process, involving decal paper for inkjets, decal lacquer, and screenprinting. While I was successful at making a few sets, there was a lot of wastage involved and huge amounts of time. It takes full advantage of commercial printer's ability to print "4 colour", so we could do nice fades. Rather than just printing "little fish" in comic sans on the downtube, we instead designed a nice graphic version, with block letters, and with a cool shapely S to set it off. 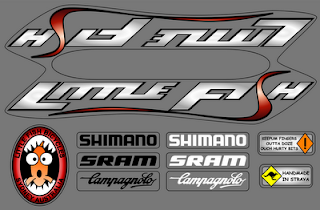 Anyway, I reckon it'll look good on a bike. Only problem is, I sent the files to a couple of decal printers, and they're not interested. They just have too much work on, and they see my little job (rightly) as too fiddly. The printer that these decals are targeting is a Gerber edge FX, which at least doesn't involve making screens. 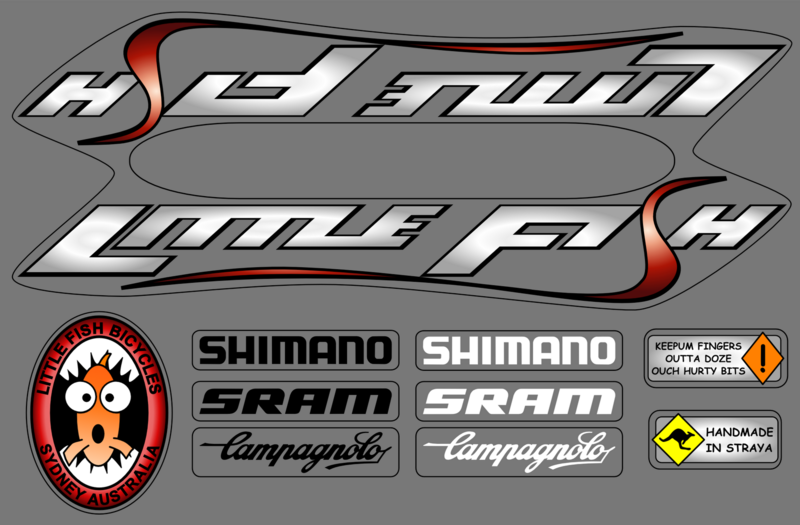 Fingers crossed - hopefully soon I'll have a pile of nice shiny decals to finish my frames off with. And they produce really rather nice water slide transfers. I've only made black on clear so far (no colour laser printer at home) but expect the colour will work just the same, (except no white ink in a colour laser printer?). Just need clear coating once applied. As you said, there's no ability to print white with an inkjet or laser printer. The colours you get also tend toward the translucent side, so they look a little anaemic. Further, the UV stability is an issue - they tend to fade in sunlight. Hence buying decal lacquer and going the screen print route - more involved, but significantly better results. I've just started to learn how to build a bicycle frame. Your blog helps me a lot, however since I am totally blank with this I still need to get more information about it, so I haven't started with the action yet. Thank you Suzy, your blog encourage me for keeping stepping forward for making my dream come true. Is it just me or has the decal page on your website gone missing? By the way, I love your stuff! You've got a new fan (me)!